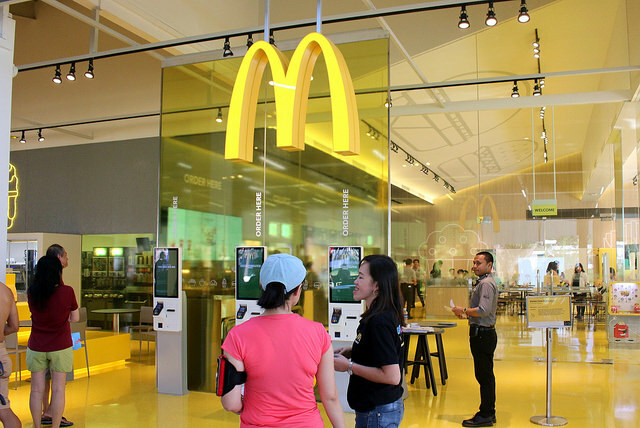 McDonald's at Marine Cove held many memories for folks growing up near the East Coast Park. Every weekend it would be packed with families who were visiting the beach. Do you remember the skate-through? The cosy ambiance? The tiny playground? It's the outlet closest to my home, so it was extra special to my family too. Well, this was all taken away in 2012. We waited and waited for NParks to complete the revamp of Marine Cove. We didn't know it would take four years (jeez, even the Marina Bay Sands was built in less time!) but you know what? I'm just glad it is finally back. And wow is it back in a big way - so bright, cheery and airily spacious! We were one of the first people to see the new outlet. 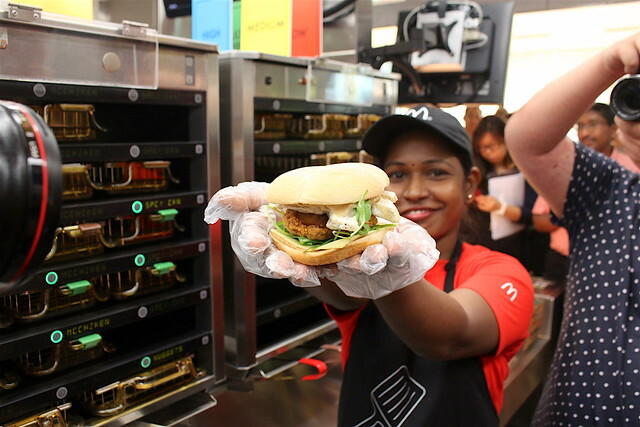 Faz Hussen from McDonald's welcomed the media at a special preview. This outlet officially opens tomorrow, Saturday, 2 July 2016. 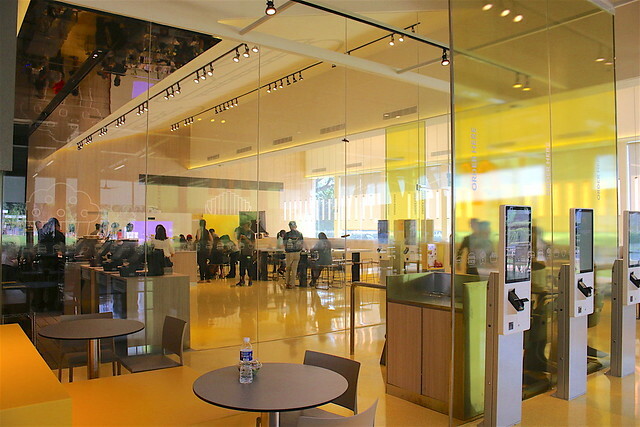 This 8,439 square feet flagship outlet is now one of the largest in the chain. It's a total departure from what it used to be. 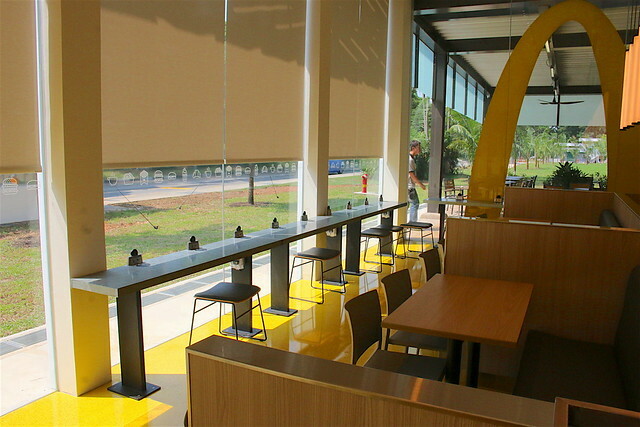 Now you have clean modern lines, high ceilings, contemporary floor-to-ceiling glass walls, and a super yellow theme! It's nice of them to build enough distance and partitions between the seats, so you can enjoy your meal with some privacy. Walking space is plentiful, but I reckon the large empty area in front of the cashier is going to be packed on weekends still. 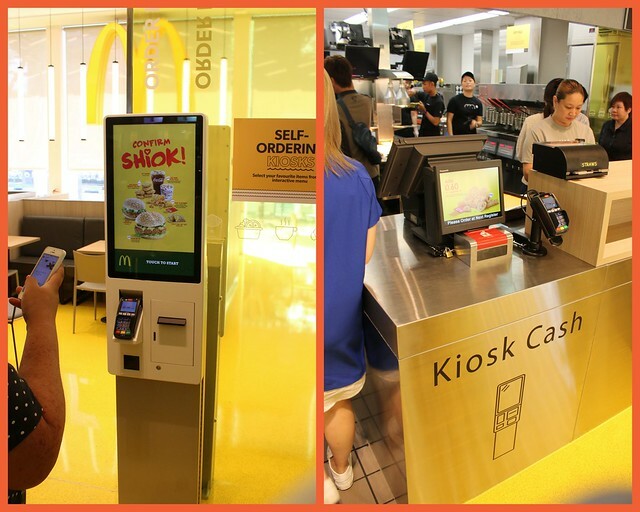 One thing that might help with the queues are the seven self-ordering touchscreen kiosks. You can pay electronically (your order gets going in the kitchen as soon as payment goes through) or by cash at a special kiosk cashier (your order doesn't start when you get your printout, only when payment is completed). You can also adjust and fine-tune the products in your order (e.g. take out tomato slices, add extra mayo, etc). My advice - unless it's a matter of life or death, don't change a thing; perusing the myriad ingredients will slow you down horribly and make me have to wait even longer behind you. I know people who don't like these touchscreen kiosks but I can see that once you get used to them, they can help you skip the queue. What's really cool are these charging stations for your mobile devices. If your phone has Qi charging, just place it over the embedded wireless charging port. 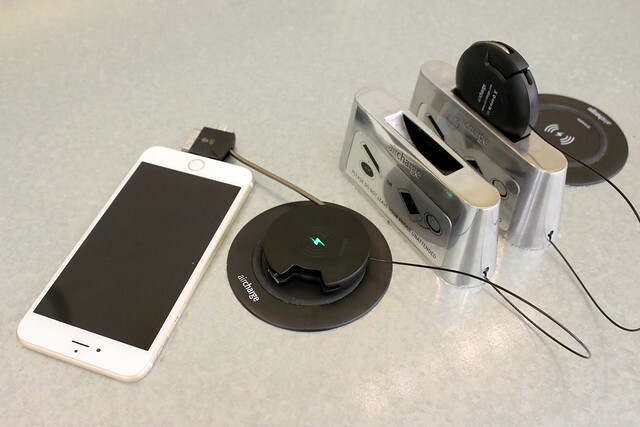 Else plug in your device and place the black disc above the port until you see a green charging icon light up. People are so going to fight over these, right? Well hopefully not. They've placed them on the communal tables as well as the perimeter seating - so there's plenty! Too bad there are no laptop charging sockets. Which is probably good, or else we'll have people squatting here all day for work. 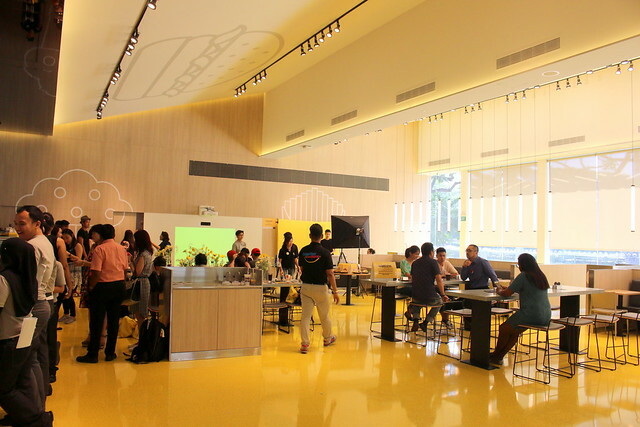 The Marine Cove outlet is geared towards families, given the kind of crowd at East Coast Park. There's pram parking in front, to allow young families to eat in comfort. Kids are going to love the Shadow Wall! Maybe adults too. When you walk past the wall, your shadow will be transformed to that of McDonaldland characters like Ronald, Grimace and the Hamburglar. 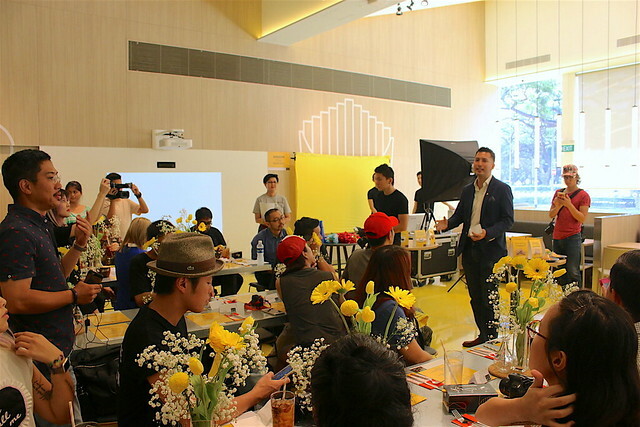 If you'd like a VR-style 360-degree tour of the outlet, try the Google Cardboard. 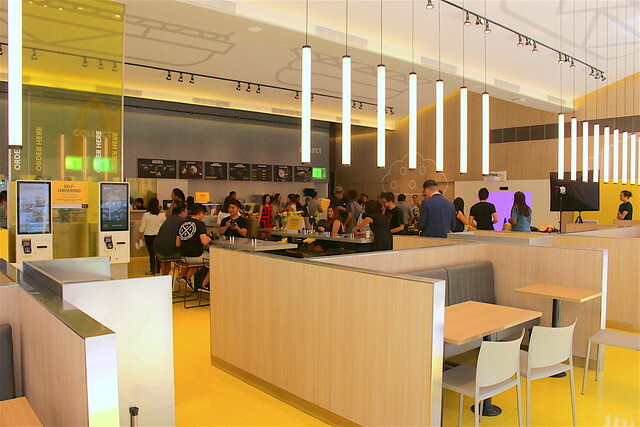 These fun tech diversions are also going to be at 12 other outlets. I'm surprised the kitchen isn't much bigger than most other outlets. 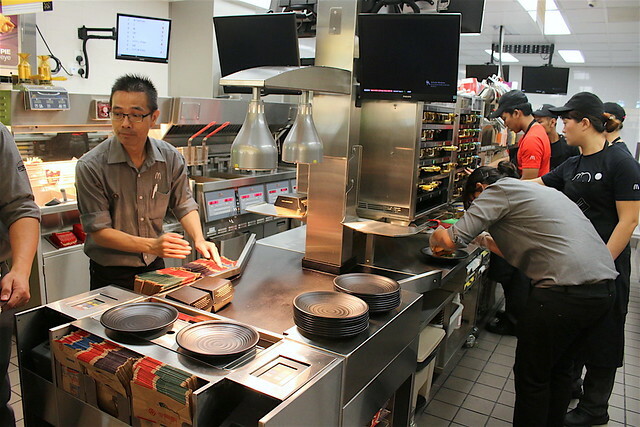 This restaurant seats about 400, so these guys are gonna be busy. And most of the burgers are made only upon order. Foodwise, they have some exclusive items at this outlet. 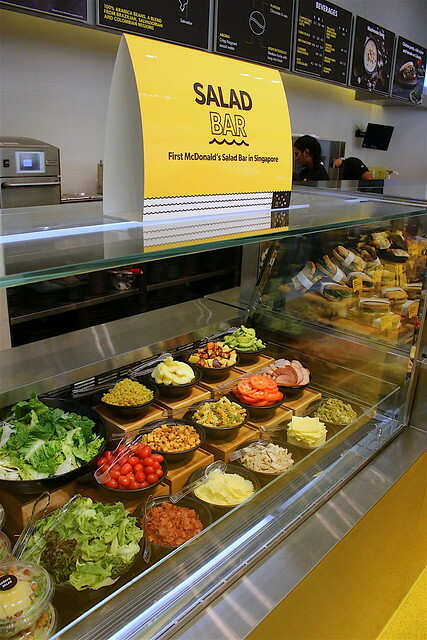 You won't see a salad bar at other McDonald's. Choose from Classic Green Salad, Caesar Salad and Asian Salad with Roasted Sesame Dressing (clearly Goma inspired) and customise it to your heart's content with different toppings. The new @mcdsg at Marine Cove offers a Signature Collection of #premium #burgers only available here: #Spicy #Chicken with Apple Slaw; Classic Cheese; and Spicy Tortilla. 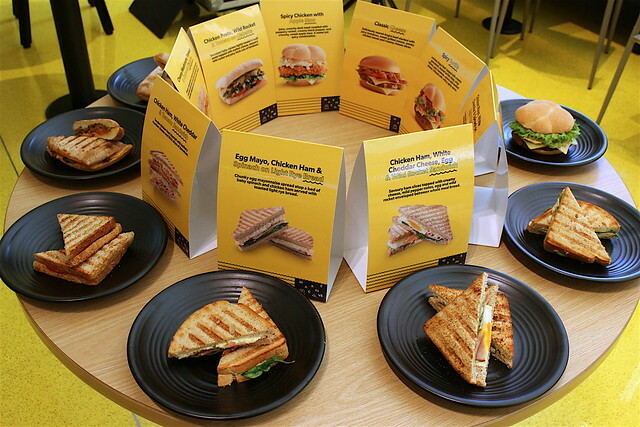 There are also toasted sandwiches from #McCafe. These three premium burgers will only be available here. I tried the Spicy Chicken with Apple Slaw - it's McSpicy with the sweetness of apple and peppery bite of rocket. I do wish the creamy dressing was more tart than sweet so that it can help cut through the greasiness. We need lime-Sriracha-mayo! The Classic Cheese and Spicy Tortilla feature a delicious Angus beef patty. The latter sounds great with melted cheese, creamy guacamole, crunchy tortilla chips, whole leaf lettuce, tomatoes and onions all topped with a fiery spicy sauce. The Marine Cove McCafé will serve toasted sandwiches in six different variations, two of which are exclusively available here. There are also two soups - Broccoli (surprisingly savoury) and Mushroom (with discernible bits of shiitake and button). There are also more sweet treats here like Affogato and Belgian waffles. I'm eyeing the Gula Melaka and Coconut Swiss Roll though. 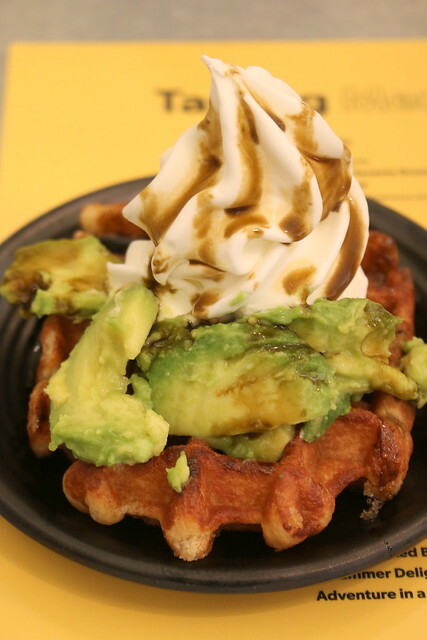 The Belgian Liege Waffle with Gula Melaka Syrup, Avocado and Sundae looks awesome. It would have been a great dessert if the individual components had something to bind them together, so they didn't taste so disparate. More Gula Melaka? Puree the avocado and make it a soft-serve? Well, I still liked it because avocado rules. Oh there are more sweet treats outside at the Dessert Bar. Customise your McFlurry or Sundae with 17 different toppings like Rainbow Butter Bites, Mixed Berries, Chunky Purple Potato Sauce, Salted Caramel Dip and Corn Flavoured Cereal. Wait, what? The cornflake-like things are not corn but corn-flavoured something else? That's a little disturbing. 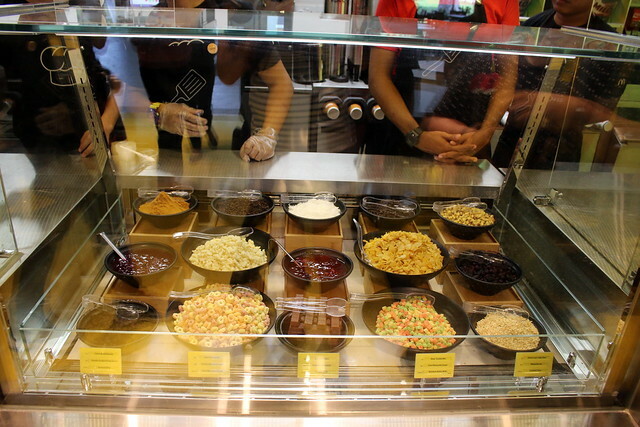 But it's OK, I have 16 other toppings to pick from. Or I could just go for an Adventure in a Cone. 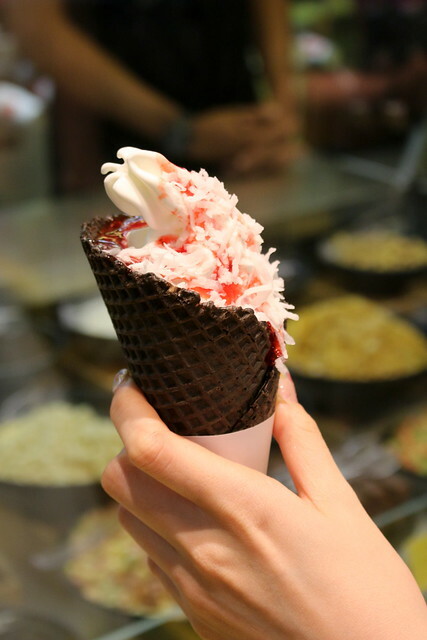 Vanilla soft serve topped with coconut flakes and strawberry sauce, served on a chocolate waffle cone...mmmh. McDonald’s Marine Cove may not have a drive-through or skate-through but this is still going to be the place where new memories will be made. Many thanks for the invitation and sneak preview! Me n my husband love to watch the sunrise at the sea while enjoying our breakfast with a cup of brew coffee and egg benedict and add a frozen yoghurt coffee flavor while my gal can enjoy herself playing at the kid play area, it definitely made our day! Really excited to revisit The Coffee Bean @ Marine Cove, and hope I can win to bring along my parent to enjoy it together..